The all new WPS-400 Ozone Generator – a high quality oxygen-fed ozonator. Is an ideal source for creating ozone for water purification and ozonated oils, etc. The WPS-400 takes the oxygen coming in and transforms it from two molecules of oxygen to three molecules (O3). After about a half hour, the molecules break up again into one stable oxygen unit and one singlet oxygen molecule. Has a unique quartz glass ozone tube that does not come in contact with metal and will not generate heat. At around 100 gamma, the. Has one of the. In the world of any professional grade Ozone Generator. It comes standard with ozone resistant fittings and silicon outlet hoses. It is ideal for any application that requires dependable and stable ozone production. It’s built to last for years without any maintenance. Is superior in quality, performance, reliability, and workmanship to all others on the market. The front control panel includes a variable control selector switch that allows for an unlimited number of output settings. Both inlet and outlet hose barb fittings will take a 3/16 silicone hose. A low voltage, cold process. No cooling fan is required. Unit has no moving parts. Generator is affordable, compact, portable and very easy to operate. Built for continuous, efficient operation in harsh environments. Dual phase electrical short circuit protection. Long trouble-free life from solid state power supply module, transformer and dielectric cell. Low Frequency, will comply with the most stringent government radio frequency standards. No overheating of dielectric cell and power components. Non-leaking glass quartz tube discharge dielectric reactor cell. Output range selector variable switch. Ozone resistant fittings and silicone tubing. Stable ozone concentration levels. Stainless and Quartz Reactor Chamber. No cooling fan necessary. UL and CSA recognized components. Comes complete with power cord, and silicon hose. Electrical: 120 Volts AC. Construction: Crush resistant carry case. Quartz, Ceramic, Stainless Steel cell. Fuse Size: 1 Amp 250 volt. 2 switches, 2 ozone controls – each chamber can be operated individually. Gamma output: approximately 100 (both chambers). Gamma chart comes with each unit when requested. Size: 4″ Height x 11.5″ Width x 9 Depth. Weight: 4.5 lbs. No health claims for these products have been evaluated by the. Food and Drug Administration (FDA), nor has the FDA approved these products to diagnose, cure, or prevent disease. Since every individual is unique, we highly recommend you consult with your licensed health care practitioner about the use of ozone products in your particular situation. You have found the manufacture so you can’t get a better price anywhere, if you find it let us know. Synergy Water Systems brings this Ozone Production Unit to the market with a very sleek slim line design. 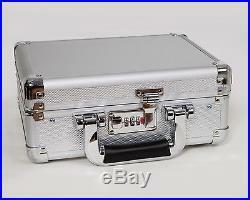 It comes in a locking flight case, padded for protection (cases may vary sometimes black sometimes silver). 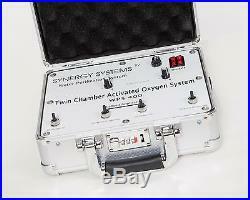 It is a twin component molecular generator that produces very strong ozone. Up to 160 ug/ml when ran in parrallel. It produces ozone by a Silent Pulse Injection Cold Corona Discharge; A low voltage, cold process that involves very little heat. It uses a regular 110 outlet, but can be used with any voltage as long as you use a transformer. This unit comes with everything you need other than oxygen. You will get the stone diffuser, and all the tubing needed to connect the system and start using it. You can use a tank or a concentrator and it will work just fine. I also have contacts for steam sauna’s at a reasonable price as well as other items you may need. Don’t spend thousands of dollars, like some companies try to get you to spend, it isn’t needed. I RECOMMEND THAT THE READER ENLIST THE SERVICES OF A DOCTOR OR QUALIFIED HEALTH PRACTITIONER WHO PRACTICES ALTERNATIVE AND COMPLEMENTARY MEDICINE. WE CANNOT BE HELD RESPONSIBLE FOR ANY USE OR MISUSE OF THIS PRODUCT. 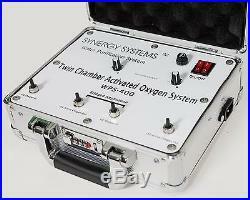 The item “WPS-400 Synergy Ozone Machine silver case” is in sale since Thursday, January 27, 2011. This item is in the category “Health & Beauty\Natural & Alternative Remedies\Other Natural Remedies”. The seller is “mygettinplace” and is located in Nashville, Tennessee. This item can be shipped to United States, Canada, United Kingdom, Denmark, Romania, Slovakia, Bulgaria, Czech republic, Finland, Hungary, Latvia, Lithuania, Malta, Estonia, Australia, Greece, Portugal, Cyprus, Slovenia, Japan, China, Sweden, South Korea, Indonesia, Taiwan, South africa, Thailand, Belgium, France, Hong Kong, Ireland, Netherlands, Poland, Spain, Italy, Germany, Austria, Russian federation, Israel, Mexico, New Zealand, Singapore, Switzerland, Norway, Saudi arabia, Ukraine, United arab emirates, Qatar, Kuwait, Bahrain, Croatia, Malaysia, Brazil, Chile, Colombia, Costa rica, Panama, Trinidad and tobago, Guatemala, Honduras, Jamaica.